Helen Thayer has been receiving attention recently in China, in part due to the achievement she and her husband Bill achieved by walking 1600 miles across the Gobi desert, but also for her life-long pursuit of fostering understanding of other cultures through sharing her experiences of exploration with others. "We want to make kids aware that they have to understand and be in tune with other environments, and they have to respect other cultures," she says. "We try to get students to increase their knowledge of other societies across the boundaries of language and lifestyle, and to promote intercultural respect no matter what the differences in the daily lives and beliefs of others. Once you get this through, you've got kids of our culture understanding other cultures. Then all cultures can come together, instead of fighting." 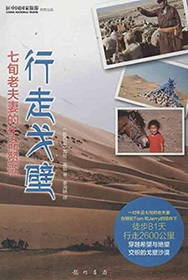 Helen's book based on the Gobi experience, Walking the Gobi, has been translated into Chinese (cover at left) and is being used in classrooms in China. It has also found a place as an exemplary text for Chinese students studying English.